An English staple during the Christmas festive season. Start by pre-heating your oven to ~190 degrees Celsius, and then cut the butter and shortening into cubes. Add into a large bowl with the flour. Combine with your fingertips for a few minutes until the mixture resembles breadcrumbs. I find the best way of doing this is to grab two large handfuls of flour and fat, press them together and rub it between your palms/fingers until it’s it’s all dropped back into the bowl and then start again. Once you reach the “breadcrumbs” stage, add the milk, a little bit at a time, mixing well in between each addition until you have a manageable dough which is still a bit crumbly but forms a good ball if pressed together. Transfer about half of the pastry to a well floured surface and start to roll out. Roll it a couple of times, and then rotate the pastry 90 degrees to ensure no sticking and even rolling. Continue rolling until the pastry is about 4mm thick. 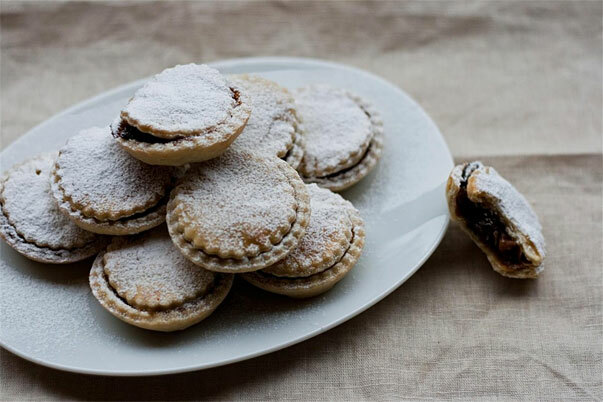 Assuming your mince pie tin has twelve slots, you’ll need one pastry cutter which is a little larger and another cutter which is slightly smaller than the slot itself. Cut twelve of the larger sizes and press the pastry discs gently into the slots, being sure to push into the corners. Place a heaped teaspoonful of Mincemeat into pastry cases and then cut 12 discs using the smaller cutter – re-rolling where necessary – and press the pastry circles gently onto the top of the mincemeat-filled cases. Brush the tops of the pies with the milk for the glaze and place into the pre-heated oven for about 15 minutes, or until starting to turn a golden brown on top. Remove from the oven and allow to cool in the tin for a few minutes before popping out onto a wire rack to cool using a knife. Repeat the process for as long as you have pastry remaining. Enjoy as they are cool, or warm them gently in the oven before serving. They make an excellent accompaniment to tea, coffee, a dessert, or just a snack. Dust with icing sugar for best results and serve with cream!